Noble began collecting information in 2010 after noticing the way Google Search and other internet sites collect and display information about non-white communities. Her results dovetail with other work (e.g., Weapons of Math Destruction by Cathy O'Neil) positing that algorithms are flawed by their very nature: choosing & weighting only some variables to define or capture a phenomenon will deliver a flawed result. 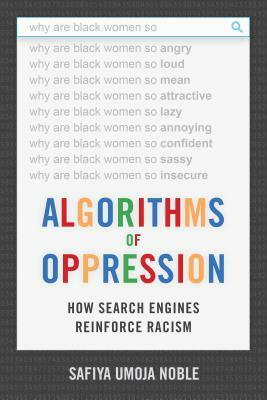 Noble wrote this book to explore reasons why Google couldn’t, or wouldn’t, address concerns over search results that channel, shape, distort the search itself, i.e., the search “black girls” yielded only pornographic results, beginning a cascade of increasingly disturbing and irrelevant options for further search. ※ We are the product that Google sells to advertisers. ※ Google & other search engines have been enlisted to make decisions about the proper balance between personal privacy and access to information. The vast majority of these decisions face no public scrutiny, though they shape public discourse. ※ Those who have the power to design systems--classification or technical [like library, museum, & information professionals]--hold the ability to prioritize hierarchical schemes that privilege certain types of information over others. ※ The search arena is consolidated under the control of only a few companies. ※ Algorithms that rank & prioritize for profits compromise our ability to engage with complicated ideas. There is no counterposition, nor is there a disclaimer or framework for contextualizing what we get. ※ Access to high quality information, from journalism to research, is essential to a healthy and viable democracy...In some cases, journalists are facing screens that deliver real-time analytics about the virality of their stories. Under these circumstances, journalists are encouraged to modify headlines and keywords within a news story to promote greater traction and sharing among readers. An early e-version of this manuscript obtained through Netgalley had formatting and linking issues that were a hindrance to understanding. Noble writes here for an academic audience I presume, and as such her jargon and complicated sentences are appropriate for communicating the most precise information in the least space. However, for a general audience this book would be a slog, something not true if one listens to Noble (as in the attached TED talk linked below). Surely one of the best things this book offers is a collection of references to others who are working on these problems around the country. The other best thing about this book is an affecting story Noble includes in the final pages of her Epilogue about Kandis, a long-established black hairdresser in a college town trying to keep her business going by registering online with the ratings site, Yelp. Noble writes in the woman’s voice, simply and forthrightly, without jargon, and the clarity and moral force of the story is so hard-hitting, it is worth picking up the book for this story alone. At the very least I would recommend a TED talk on this story, and suggest placing the story closer to the front of this book in subsequent editions. For those familiar with Harvard Business Review case studies, this is a perfect one. Basically, the story is as follows: Kandis's shop became an established business in the 1980s, before the fall off of black scholars attending the university "when the campus stopped admitting so many Blacks." To keep those fewer students aware that her business provided an exclusive and necessary service in the town, she spent many hours to find a way to have her business come up when “black hair” was typed in as a search term within a specified radius of the school. The difficulties she experienced illustrate the algorithm problems clearly. I do not want to get off the subject Noble has concentrated on with such eloquence in her treatise, but I can’t resist noting that we are talking about black women’s hair again…Readers of my reviews will know I am concerned that black women have experienced violence in their attitudes about their hair. If I am misinterpreting what I perceive to be hatred of something so integral to their beings, I would be happy to know it. If black hair were perceived instead as an extension of one’s personality and sexuality without the almost universal animus for it when undressed, I would not worry about this obsession as much. But I think we need also to work on making black women recognize their hair is beautiful. Period.